Fire+Wind=Visit from the fire department. Oops. It was not nearly as exciting as our fire six years ago, when my garden-tractor exploded after mice chewed on the electrical bits, that was epic. This...wasn't so much. Although the log from which my boy conducted the fire yesterday is, sadly, no more. But to get back to my favorite subject: books, here's a link to another blog appropriate to today's circumstances. 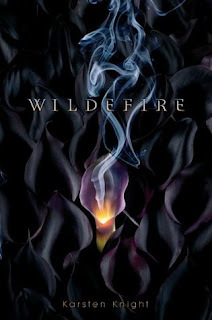 YA writer, Karsten Knight, is funny, charming, and has a book coming out in July called "Wildefire". I would like an extended explanation of the fire, please, first with a description of your expectations, then how it defied them, the expression on the firepersons' faces when they arrived, the probable expression on your face when you explained yourself, and what the two children were doing in the meantime. Oh, and a link to the tractor story, which I remember was hilarious. kthxbye.